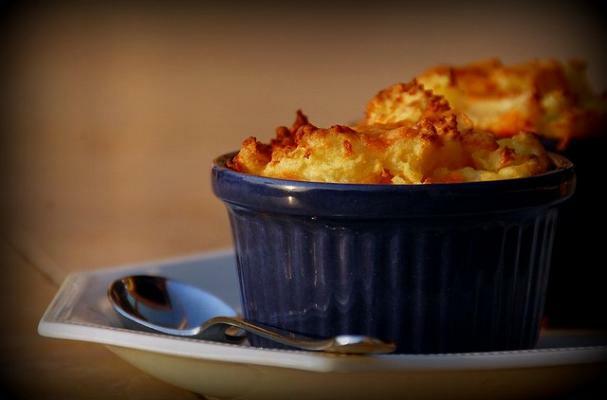 Gluten-free shepherd's pie is a favorite fall comfort food. Ground turkey is browned with onion, garlic, and cilantro before it is topped with creamy mashed potatoes. To achieve the design you see on restaurant made shepherd's pies, drag the tines of your fork across the surface of the mashed potatoes in a swirled motion. When the dish is baked, the browned surface will depict the pattern. This dish can also be made into individual portions by using ramekins. Start out by washing, peeling, and chopping the potatoes, then boil with 1 cup of the vegetable broth, and 1 cup of water for about 20 minutes, or until the potatoes are soft. Place the cooked potatoes in a food processor with the 2 Tbsp. of coconut milk, salt and pepper, and pulse until a smooth mixture is formed. Set aside, you will need this later to top the Shepherd's Pie. Next, brown the ground turkey in a frying pan over medium-high heat, with 1 tsp. coconut oil. When the meat is almost done, add the onion, garlic, cilantro and spices. Mix everything together, cover and cook for a further 2-3 minutes. Add the remaining 2 cups of broth and the arrowroot flour along with the vegetables. Bring this mixture to a boil, stirring continuously, and cook for a further 5-6 minutes, until the liquid starts to thicken. Transfer the mixture to a lightly buttered casserole dish. Top with spoonfuls of the mashed potatoes, spreading evenly until the entire top of the dish is covered. Bake in a preheated oven, set at 350F/180C, for 40 minutes, or until a golden brown crust forms. Remove and serve.